Manufactured for high traffic environments, opt for this Soap / Alcohol Cartridge Dispenser in White. With an outer casing manufactured from durable ABS plastic, it has been gently curved to eliminate the number of potential bacterial growth sites. Easy and quick to sanitise, it can be wall mounted for ease and has an unobtrusive design that suits all kinds of working environments. Internally, a quick dispensing mechanism provides a measured portion of foaming handwash or alcohol to help reduce mess. The entire cartridge dispenser has been manufactured in line with CQC HTM 01-05 and is suitable for use in dental surgeries as part of an infection control regime. 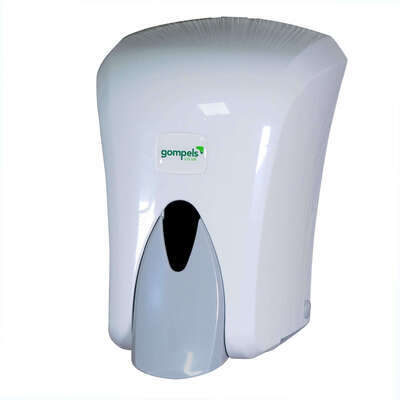 This dispenser is compatible with the Gompels Antibacterial Foam Handwash 1000ml Cartridge x 3. Consider adding our Paper Towel Dispenser C V Fold Bright White to your basket as well today? Helping to maintain a professional image in your workplace, it is compatible with our range of C or V fold paper towels.